Woah that stat is huge, nice! @Fizzer What is the all-time record high? You can really tell how much difference QM makes. Would be nice if more people joined non-QM games though. What percentage is that due to QM games? Is there a way we could get more statistics? Or is it hard to get those for you? I'd be very interested in some quick facts like what is the average number of players in a game, what percentage of games is made by the 1v1/2v2/3v3 ladder and QM? What colours are played the most and least? Congratulations Fizzer! As always this is my favorite game of all time (well this or Oblivion). Are you able to provide any other user statistics? Like # of unique profiles active during a given time period, average age of active profiles versus median age? Number of active players with more than say 500 games? Edit: Farah beat me to it! But yeah, more statistics please! In other words warlight died 1 year ago RIP. 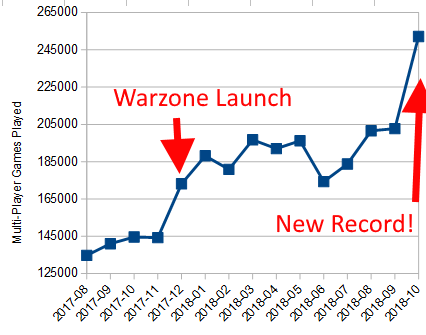 what one year old warzone was started in 2008 as warlight unless your talking about where warlight was renamed to warzone? i bet fizzer didnt know that, Logan. And congrats for that new record, very impressive! And yet Dan still has WL in his name. Stop living in the past Dan! Fortunately Dan is living in Wales instead of in the past. Dan is living in Wales instead of in the past. Its important to know about the past. I don't really have a reason for changing my name, as like linberson said, it doubles up as WaLes and WarLight. Also, if I changed my name here, I'd need to change it everywhere and that's too much effort. If someone donated enough coins for me to change my name, I will consider changing it. And yet Fizzer still has WL in his twitch name. Stop living in the past!